Developed by the California Civic Engagement Project (CCEP), this new mapping tool is designed to provide assistance to California county election offices seeking to implement the Voter’s Choice Act in the June and November 2018 elections. The goal of this tool is to help election officials identify optimal sites for potential Vote Center and Vote-by-Mail drop boxes. 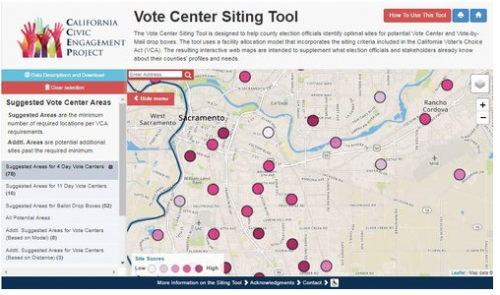 The tool uses a facility allocation model that incorporates the siting criteria included in the California Voter’s Choice Act. The resulting interactive web maps are intended to supplement what election officials and stakeholders already know about their counties’ profiles and needs. Click here to learn more about the tool or about Voter’s Choice.